For those seeking birds, you will not be disappointed. Many birds are year around residents of Shelter Island and the list is long. It includes Cedar Waxwing, Blue Jay, Black-capped Chickadee, American Goldfinch, Northern Cardinal, Mourning Dove, American Robin, House Finch, Tufted Titmouse, White-breasted Nuthatch, Downy Woodpecker, Hairy Woodpecker, and Carolina Wren. Migrating birds throughout the Spring and Fall include Rose-breasted Grosbeak, Red-breasted Nuthatch, Purple Finch, Indigo Bunting, Canada Warbler, Black-throated Blue Warbler, Palm Warble, Black-throated Green Warbler, and others. Lastly, there are the Summer visitors. 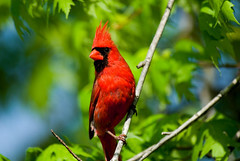 They can be a mixed variety but Scarlet Tanager, Baltimore Oriole, Common Yellowthroat, Eastern Phoebe, Ruby-throated Hummingbird, Red-winged Blackbird, Common Grackle, Great-crested Flycatcher, Black-and-white Warbler, Piping Plover, Least Tern, and Osprey. I think that covers the birds, but let us know if we missed any! This entry was posted on Monday, June 28th, 2010 at 5:46 am	and is filed under Long Island Things to Do. You can follow any responses to this entry through the RSS 2.0 feed. Both comments and pings are currently closed.